Procter & Gamble’s new Swash appliance cleans your clothes without actually washing them. 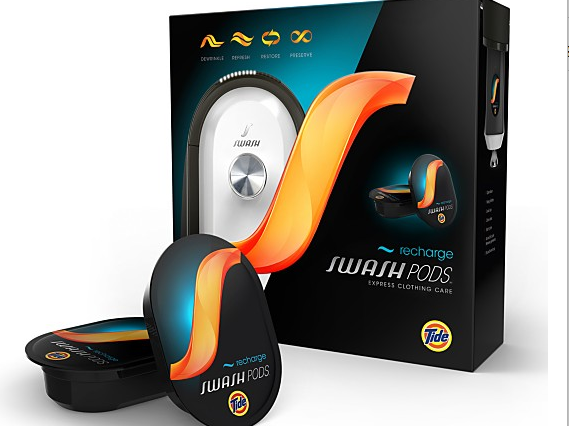 Smart geeks at P&G are teaming up with Whirlpool to create Swash, a product that deodorizes and de-wrinkles clothes with specially designed pods instead of soap and water. What’s up with these products that promise to clean without soap or water? According to P&G, 80% of consumers dislike ironing – myself included – and at least 90% re-wear a minimum of one item per week without washing (never in my entire life!). Enter Swash, an appliance that freshens clothes between washings, or saves you the hassle of a trip to the dry cleaners. Think of Swash as the Keurig of clothing. Load in a scented Swash Pod, insert a jacket or pair of slacks, and minutes later, your items are ready to wear again. All without adding any water whatsoever. Talk about dry cleaning! Originally developed with lazy college kids as the target market, Swash is now refocused on busy professionals. Swash appliances will be installed at Delta Sky Clubs, where P&G can directly access the laundering needs of this fancy-pants demographic. Retailing at $499 – and with Swash Pods costing $6.99 per 12-pack – the Swash certainly isn’t cheap. P&G is banking on the belief that, in modern society, convenience frequently trumps cost. Excuse me, but I gotta say that I am a fan of convenience. Cleaning your clothes without washing them may sound a bit odd, but P&G and Whirlpool might have the next big thing with Swash. If you could save a little time each day by skipping the dry cleaners, or not doing that extra load of laundry, would you? Yeah, me too. I don’t even use Purcell.